This collective work brings together scholars, international civil servants and field practitioners who examine a wide range of theoretical and practical problems as well as challenges confronting the world and the United Nations at the dawn of the twenty-first century. The papers in this volume have been organized under themes which focus on problem areas and challenges that mankind must unavoidably deal with collectively in the years ahead, much as it has attempted to do during the past half-century. 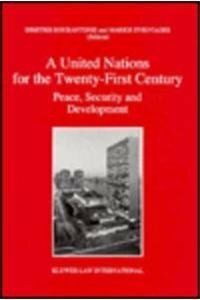 The contributors address the triangular relationship between peace, security and development and raise questions about the relevance of the UN system in the decades to come. The authors do so through reflection on past experiences and relevant philosophical inquiries. They examine specific cases and experiences that are representative of the relevance or irrelevance of past collective actions in the security and non-security fields and suggest new ideas and concepts that attempt to marry theory and practice. In this connection, aspects of peacemaking and peacekeeping, arms control, economic development, human rights and the critical role of education are amongst the topics analyzed and assessed. One of the underlying themes of the volume is that the challenges of the twenty-first century will be of unprecedented magnitude. Unless the UN system is reformed and revitalized it runs the risk of becoming irrelevant.